You may have seen Hang-A-Pot used by professional designers and landscapers on the home and garden channels. Order your set of these amazing clay pot hangers today! From interior design to outdoor hanging planters, here are a few decorating ideas from our customers for around your property. The options are endless with these versatile plant hangers and plant poles! Window Box Effect: Hang three or four terracotta pots under a window to create a European flower box effect. Consider using trailing or cascading flowers for a more dramatic effect. 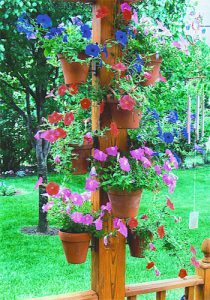 Herb Garden on a Pole: For stunning container garden design, use a piece of fence post or a 4×4 piece of wood and hang clay pots filled with a variety of herbs to create a vertical herb garden. Orchid Displays: Hang orchids in clay orchid pots on one or more of our plant stands, on a wall, between windows, or on lattice (see our Orchid Lovers page). For optimal display, use odd numbers and angles. Greenhouses: Create space for outdoor hanging planters in greenhouses by hanging flower pots on any surface. Accent a Fence, Deck or Wall: Hang-A-Pot attaches easily to stucco, brick, stone, or concrete walls. Container Gardening: The container garden design options are endless with Hang-A-Pot. Many customers use the clay pot hanger to create vertical vegetable gardens. One customer won an award for her strawberry patch flower poles using little pots at the top and bigger pots going down the pole. Hot Pepper Pole: Hang many varieties of hot pepper plants on a pole for the patio or garden. Kitchen Helper: Hang a pot or two in the kitchen near the stove and use them to store kitchen utensils such as wooden spoons. Bathroom Design: Hang painted or decorative ceramic or clay pots to match color decor and place silk plants in them. Many craft stores have paints and other craft supplies for designing with pots. African Violet Plant Stand: Hang your prize violets on one of our flower poles in the room where your violets thrive. Because our flower poles have wheels on the bottom, you can easily move your violets from room to room to enjoy their beauty throughout your home! Walls: Accent walls with houseplants or silk flowers. One television designer hung pots of silk daisies on each side of a living room window where the curtains were gathered and tied. Storage Organizer: Hang pots on a pole or wall to organize garden tools or craft supplies. Just wanted to let you know that I received my “Hang-A-Pot” order and I absolutely love, love, love them! My yard looks fabulous with my little pots on my fence with wave petunias in them. Great job guys…thanks! I’ll tell all my friends for sure and once people see them, I know they will want some. I use these often as gifts for friends and neighbors and they are always well received. Thank you, Ralph! As always Hang-A-Pot is the best; I love them and they are everywhere around my yard.